Walking into JJ's is like setting your day on "pause." There's no rush here; even during high-traffic times, the expansive space feels chill and uncrowded. Service is friendly but not overbearing. The food's not foo-foo, but it's really good. It's that kind of "come as you are," "just be you," "laugh as loud as you want or sit in a corner and watch sports" place that drops your blood pressure every time you raise your glass. Basically, it's what Santa Clarita's often not - and for those not caught up in the "see and be seen" scene, that's a good thing. JJ's doesn't take itself too seriously, but there's seriously good food to be had on the surprisingly-long menu. 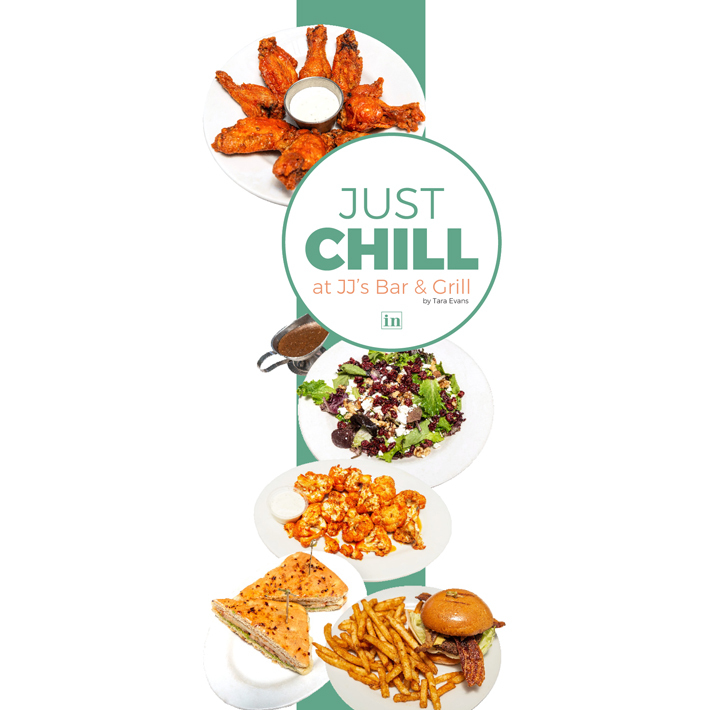 Pair any of JJ's great drinks and bar specials with these make-you-smile meals the next time you roll into Santa Clarita's "Best Bar," according the SCV community two years in a row. Nosh on eight deep-fried chicken wings tossed in house-made Coca Cola barbecue or JJ's mildly-spicy buffalo sauce. Whichever you choose, each meaty bite is sure to please. Want it hotter? They can do that. The vegetarians and the carnivores alike couldn't get enough of the fresh cauliflower florets fried to a yummy crisp and then tossed in buffalo sauce. The texture's toothy, not overdone, and the result is a super-satisfying menu item that's guilt free. JJ's French fries are so good, my dining companion and I decided that they needed their own mention. Freshly-sliced potatoes deep fried to a golden crisp and served with ketchup, ranch dressing, chipotle aioli, mustard or barbecue sauce, these crispy-on-the-outside, soft-on-the-inside beauts are officially my new favorite fry. Get a full order if you intend to share; these go fast. Yes, you can get a great salad at a bar - and the proof is in the pile of gourmet field greens tossed with cranberries, walnuts and gorgonzola cheese crumbles in a balsamic vinaigrette you get at JJ's. It's a generous portion, it's fresh as fresh can be and it's can't-stop-eating-it savory-sweet deliciousness. This rib-and-prime-beef blend, cooked to order with monterey jack, crispy bacon, fresh lettuce and sliced tomato on a toasted brioche bun with garlic aioli, this richly-flavored burger will make you forget any other "hook" version you might be tempted to try. JJ's has a surprising amount of vegetarian-friendly food, including this savory sandwich with melted mozzarella, house-made pesto and fresh tomatoes. JJ's Bar & Grill is located at 25848 Tournament Road in Valencia. This place is big enough to host your team, your fantasy football crew, your business mixer... so reach out to Jeff and make it happen. He's an e-mail guy: jeff@jjsbarangrill.com. Call to find out about the latest specials, because there's always something fun (Karaoke, Dodger's events, happy hour, Taco Tuesdays, etc.) happening here, too.